We humans were unthinkingly pouring more and more such chemicals into the biosphere. Some of them, even at very low doses, can profoundly disrupt many facets of human and wildlife biochemistry, not just the endocrine system. Colborn came to the topic well prepared. Back in 1947 she had obtained a B.S. in pharmacy from Rutgers University and began her career as a pharmacist. Three decades later she returned to college and in 1981 graduated with a master’s degree in freshwater ecology from Western State Colorado University. Then in 1990, as a 58-year-old grandmother, Colborn earned a Ph.D. in zoology (with minors in epidemiology, toxicology and water chemistry) at the University of Wisconsin-Madison. She passed away last December in Colorado. A pioneering work reminiscent of Rachel Carson’s 1962 classic Silent Spring, Our Stolen Future reported on Colborn’s own research showing that among predators at the top of the food chain in the Great Lakes, female vertebrates (birds, fish, mammals and reptiles) were passing manmade, persistent chemical toxins onto their offspring internally. These chemicals were disrupting sexual development in young organisms even before they were born or hatched. 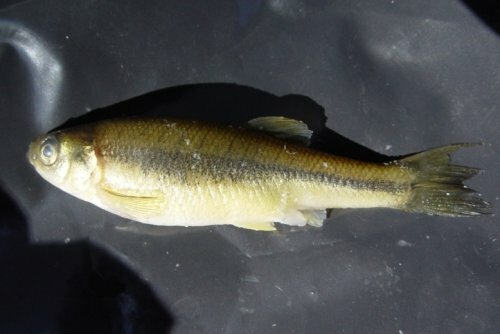 Feminized male fathead minnow – feminized male fish can’t reproduce. Recent research by Rebecca Klaper and colleagues at the University of Wisconsin-Milwaukee on concentrations of pharmaceuticals in Lake Michigan found evidence of 32 pharmaceuticals and personal care products in the water and 30 in the lake’s sediment. The widely prescribed antidiabetic drug metformin was at the top of the list. Even at two miles offshore, it was measured at concentrations of concern. Metformin had been thought not to cause the adverse effects that endocrine disrupters do. But recent lab experiments conducted by Klaper and her team found that male minnows exposed to metformin at concentrations equivalent to those of wastewater treatment plant discharges are indeed feminized. And feminized male fish cannot reproduce. Pharmaceuticals are virtually ubiquitous in wastewater (sewage). They get there primarily, as would be expected, via human urine and feces flushed down toilets. While sewage or wastewater treatment plants are able to filter out some pharmaceuticals, most pass through unaltered and are discharged to surface waters with effluent. Metformin, for example, resists common water treatments like UV light irradiation. At this point, technologies such as ozonation and nanofiltration that could eliminate these chemicals are prohibitively expensive. Thus, in places of high human population density, i.e., urban areas (cities and towns), waters downstream of wastewater plant discharges show higher concentrations of pharmaceutical compounds and their various metabolites than less densely populated areas. As populations and cities grow, so does the extent of contamination. Scientific research into the possible ecological and population-scale impacts of drugs is in its infancy; studies have looked at just a few of the estimated 4,000 pharmaceutical chemicals used globally in medicine and agriculture. The degree of severity of long-term, cumulative, chronic ecological impacts can only be speculated at this point. Occasionally, stories come to light about the potential for serious, widespread ecological effects, such as the deaths of millions of vultures in India and Pakistan in the late 1990s due to kidney failure from eating livestock carcasses that contained the anti-inflammatory diclofenac, which treat lameness and fever in cattle. One long-term hope is the potential for designing more biodegradable drugs in the laboratory, so-called “benign by design” products. In the meantime, the lesson once more is that the indispensable accoutrements of modern living, compounded by 7.3 billion people living on the planet, can have pernicious and pervasive – and at first unseen and unsuspected – side effects and unintended consequences on nature.